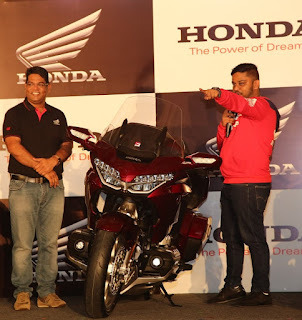 Bangalore, July 24, 2018: Honda Motorcycle and Scooter India Pvt. Ltd. today announced the commencement of deliveries of 2018 edition Gold Wing in Bangalore. The 2018 edition of the luxury tourer made its India debut at Auto Expo in Feb ‘18. This new edition of the tourer is lighter, more powerful and quick in riding. The touring icon now comes with newly-developed horizontally-opposed 6-cylinder engine, 7-speed Dual Clutch Transmission (DCT) and is the first Honda to get a double wishbone front suspension. The 2018 Gold Wing will be available in Candy Ardent Red colour and priced at Rs. 26.85 lacs (Ex-showroom, Delhi).